Looking for new content ideas for your editorial calendar or recommendations for items to share on social media? There are several online tools that make it easy to find the latest trending topics as well as the most popular content being published in each of these subject areas. Some of them are completely free, and many others have free limited versions available. Here are a few that you may want to check out. 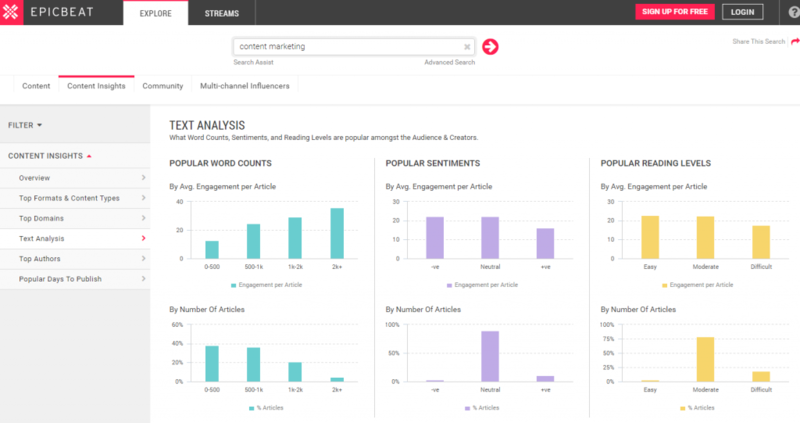 Epicbeat has a ton of features for researching the latest topic trends, finding engaging content within specific topics and identifying influencers. The free version allows one user and includes unlimited searches as well as the ability to set up one alert, and paid plans start at $39 per month. The Content Insights provided by the tool are particularly nice if you’re trying to gauge what types of styles and formats are most popular for content consumers in a particular niche. For example, you can use Epicbeat to see how different word counts and reading levels affect average engagement for an article and take advantage of that information when planning your own editorial calendar. 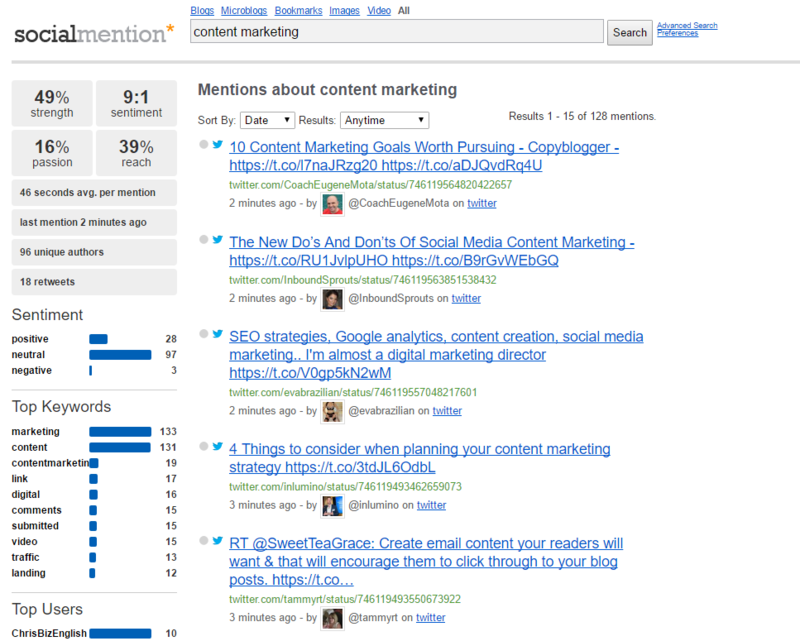 You can also view average engagement metrics for top authors and top domains in any subject area. 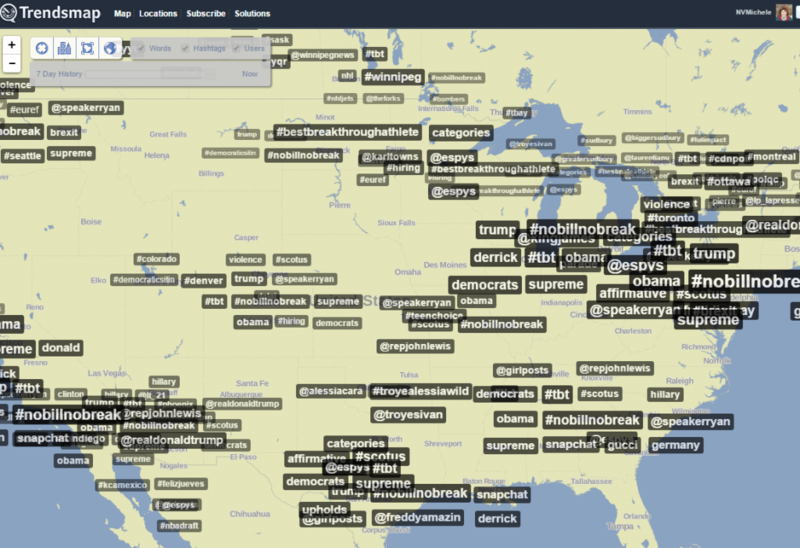 With Trendsmap, you can view a visual representation of Twitter trends by geographic location. The free version of Trendsmap provides limited access, but if you find the tool useful, you can upgrade to one of the paid plans, which start at $9 per month. Not a fan of the map view? You may want to follow one or more of Trendsmap’s Twitter alert streams for major cities and regions around the world to get real-time updates of new and emerging trends. 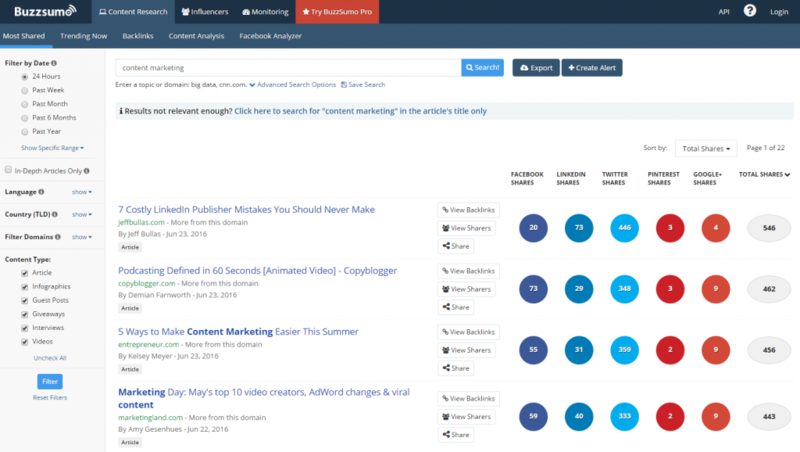 BuzzSumo is one of the best tools around for finding the most popular content on a wide range of topics, but it’s also one of the more expensive ones on this list. There is a free version of BuzzSumo with limited functionality, and paid plans start at $99 per month. When researching a particular topic, you can restrict your search by content type, how recently the content was published, language and more. The returned results will be sorted by total social media shares, but you can choose to sort by shares on a specific network, such as Facebook or LinkedIn, instead. Paid users of BuzzSumo also have access to the View Sharers feature that allows them to see who has been sharing particular pieces of content. Additionally, there is a Trending Now section within BuzzSumo that shows content that has been rapidly gaining share counts for the last 24 hours. Sometimes, you can utilize this information to identify items that are on the verge of going viral – which can be extremely helpful if you share third-party content on your social media accounts. Unlike most of the tools on this list that base their results on social media metrics, Google Trends reports current and historical organic search trends. Because of this (and because it’s free), it complements our other listed options nicely. On the home page of Google Trends, you’ll see a few featured insights along with a list of stories that have been trending for the past 24 hours. You can also enter a specific topic to explore and see how interest in that topic has changed over time as well as how that interest varies by geographic region. Depending on how broad or narrow the topic is, you might also be given a list of related search queries. Twitter’s Curator is a great resource – even if you’re not a frequent tweeter. Within Curator, you can set up projects that track keywords and then view the most popular content associated with those terms. The tool also shows how the keywords are trending on an hour by hour basis, which can be very useful if you schedule your tweets. Curator is free, but you do need to be logged into your Twitter account to use the service. 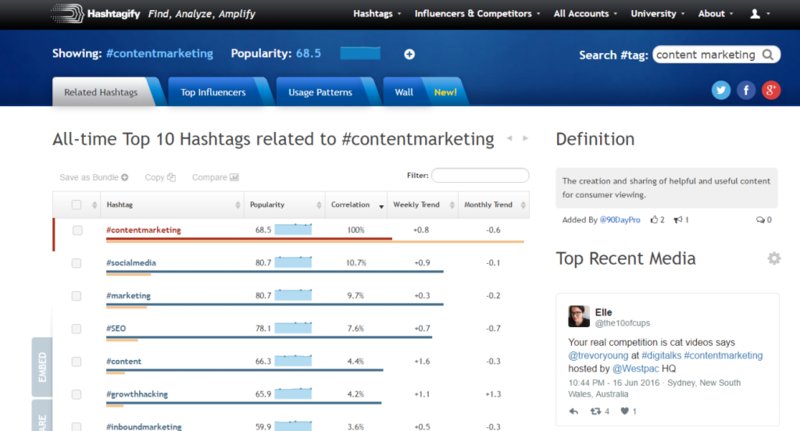 Hashtagify is another tool that tracks what’s trending on Twitter, but it focuses mainly on hashtags. Just enter a keyword in the search box, and you’ll get a list of the top hashtags associated with that topic along with each one’s popularity and trending metrics. If you create a free account, you can also access additional data about the usage patterns of particular hashtags. The free version of Hashtagify offers a lot of functionality, but if you want to access some of the more advanced features of the tool, you’ll need to upgrade to one of the paid plans. Pricing for the paid plans starts at $9.99 per month with discounts available if you pay for a full year at a time. If you’re more interested in entertainment and news topics, take a look at What’s Trending – a website devoted to “covering and curating the most viral and shareable content across the social web.” Although it is limited in scope in terms of subject matter, it’s a nice resource if you’re looking for something funny or inspiring to share on your Facebook page. 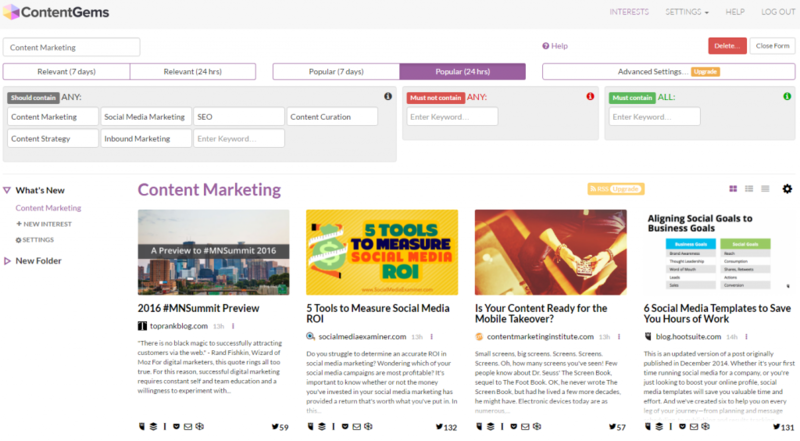 With ContentGems, you can create custom streams that pull together the most popular content on a given subject. To generate your personalized dashboard, just enter the keywords you want to track in addition to any subtopics you want the stream to exclude. If you like, you can go a step further and specify which sources you want to include (and which ones you don’t). The free plan lets you create one interest grouping, which may be enough if your site has a narrow focus. If you need to put together more than one topic stream, you can sign up for a paid plan. Pricing starts at $99 per month. Social Mention is a social media search platform that combines results from over 80 different sources, including Twitter, Facebook, YouTube and Google. Social Mention is currently a free tool – you don’t even have to create an account to use it. You can only sort the results in two ways – by date and by source – so it can be hard to distinguish between what’s popular and what’s not. However, you can get some very helpful information from the data on top keywords, top users, and top hashtags shown in the sidebar of the app. 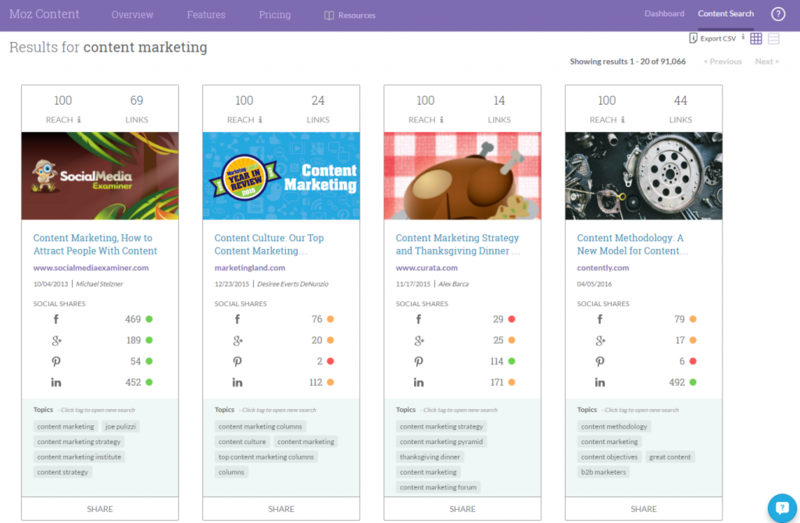 Along with providing tools to help you audit the content on your own website, Moz Content lets you identify and analyze top-performing content on other sites. Enter any search term to get a list of popular articles on that topic, with popularity measured in terms of both social sharing and inbound links. The free version of Moz Content lets you perform 10 content searches per day. Paid plans start at $59 per month and allow unlimited content searches and results. Look into how you can monetize the traffic to these pages using only banner ads and display ads. See how to source and find topic information that people actually want to read.